Much as we love Bangkok, we know that not everyone does, so here’s a three centre Thai trip that skips Bangkok - head to Chiang Mai first, then to gorgeous Phi Phi Don, and finish in beautiful Krabi. Fly from Heathrow to Chiang Mai, arriving the following day. Departures from other UK airports are also available, please ask for details. On arrival, you'll be met at the airport and transferred to the Kantary Hills Chiang Mai for a three night stay. Our holidays to Thailand are extremely flexible so if you’d prefer a shorter or longer stay just ask! You now have a few days to explore fabulous Chiang Mai, and the surrounding countryside which is home to plenty of Thailand’s wildlife - if you’re planning on meeting the local elephants we urge you to visit one of the more ethical venues where the elephant’s welfare is priority. Transfer back to Chiang Mai airport for your onward flight Phuket. On arrival you’ll be met and transferred to the Phi Phi Islands by road and boat, and on to the gorgeous Phi Phi Island Village Beach Resort for a three night stay. A range of hotels is available and durations are flexible, so you can stay for as long as you wish. 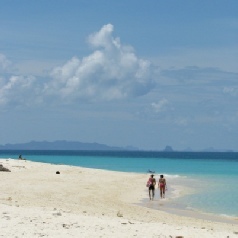 Spend your time relaxing on Phi Phi, with beautiful beaches and a chilled atmosphere to help you. Heaven! Transfer by boat to Krabi and onwards by road to the Deevana Plaza Krabi Aonang, for a seven night stay. A wide range of hotels is available and durations are flexible, so you can stay for as long as you wish. Spend the rest of your stay in Krabi exploring the beautiful scenery that this corner of Thailand is famed for, or just simply relaxing on the beach or by the pool. Return transfer to Krabi airport for your return flight to the UK.